For the devoted pet owners, leaving home for an outside stroll or outing can be a mind-wrenching moment. All pets like to stay close to their parent and the best cat strollers can serve the purpose perfectly! 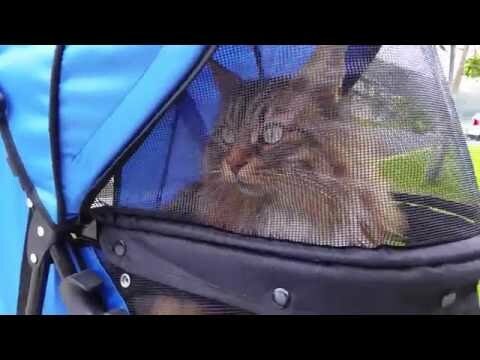 When I bought a cat stroller to test with my cat, Dylan, it turned out to be a delight for both me and her. As an attached-around-the-hip cat, she was tremendously happy with the stroller as a portal to carry her around wherever go. In this article, I am recommending the 5 best cat strollers that you can consider and buy for your four-legged friend. Trying to control your feline in a large crowd of people is not an easy task. It is a hard job to refrain your four-legged friend from consuming the trash or food that she sees lying on the ground or from wrapping around a person’s leg. Cat strollers can help you in handling those habits of your feline. Owning a stroller can allow you to choose the interaction level of your kitten with those around you. A stroller can protect your kitten from contracting any illness derived from nose-to-nose interaction with other cats, a friendly pat, or playing in grass or sidewalk areas. Injured cats that cannot walk or can only go restricted distances require fresh air and sunlight too. Cat strollers are ideal for getting your ailing pet the outdoor entertainment that it deserves and needs. Older pets suffering from hip, arthritis problems or tender paws would appreciate getting outdoors without all the pains and aches. Indoor cats love the stroll experience and are even social and friendly in public. Trying to manage your cat in a crowd-full of people is no easy task. A stroller is best to keep your cat from getting around people’s legs, devouring the trash quickly or stepped on. You can also take your cat with you to places where they’re restricted normally. Cat strollers can also be used as a napping space inside the house. When you’re working outdoors in the backyard, your cat can observe you from the security of the stroller and you need not worry about the cat wandering away as well. If you are planning to visit a vet, then these cat strollers can provide you an ease in carrying your pet to the vet doctors. That way you will be relieved as you will not have to think of the ways to prevent your cat from other animals, which are aggressive, sick, and irritable. The paws of your cat can get hurt because of concrete, particularly during the hot summer days. Moreover, the litter present on the side of the road can also hurt the paws of your dear pet. A cat stroller protects your cat’s feet from the roadside dirt and keeps their paws safe and clean. There are certain cats, which don’t like to walk on a leash or a harness if training is not given to them as young felines. These strollers are one of the ways to have a quality time with your feline outside. This is not only great for your four-legged friend but for you as well. 34" x 17.5" x 39"
23.6" x 11" x 26.4"
Your cat is like a family member to you and you would like to take her along, wherever you go. A pet stroller is a great way that allows you to take your feline for family outings or a walk with ease. Mentioned below are the reviews of the best cat strollers. This is the best product among the others, on account of its great quality and reasonable price. This four-wheeled cat stroller is perfect for pushing your pet around everywhere you go. It has a dimension of 34 x 8 inches when folded and can hold pets weighing up to thirty pounds. Its large, zipper-accessed compartment can keep your pet safe without compromising on comfort. The interior is protected with leashes and zippers, without being too hot. This stroller is easily foldable and can be used for keeping some other stuff as well. Available in 8 different colors, this pet stroller has integrated cups for the convenience of the owner. Additionally, this stroller has windows for clear visibility and ventilation. This stroller is a safe way to transport your kitty from one place to another with ease. The handles of this pet stroller are padded so that the owner can hold the stroller comfortably. Need to assemble wheels yourself. Cup holders aren’t elevated enough for holding water bottles. This is the Alternative Pick next to the editor’s pick. You can confidently take up this option in case of the best product unavailability due to out-of-stock reasons. This product is the ideal choice for those families having a big cat. This cat stroller can be bought in many quirky colors as well, such as jaguar, boysenberry, and pine green. You will not have trouble when trying to open and close the stroller without zippers. No-Zip technology lets you easily access your pet without fumbling with zippers. This pet stroller has 2 compartments and security breaks. Moreover, it has the secure leash connection inside and new panoramic view window keeps your pet safe inside of the stroller without missing any sights while you walk. Plus, this pet stroller also features an elevated paw rest. This pet stroller can be used on a regular basis. This product is lightweight and meets all the quality standards. Suitable for pets up to 25 pounds. This is the Budget Pick stroller that can be bought with security on a limited budget. The stroller can be easily folded. Additionally, it has cup holders, which can be used for keeping treats, water bottles, and toys. Moreover, it has roomy storage basket, rear and front entry tops, Ventilation Mesh Window, water-resistance, and made from quality nylon materials. The stroller is perfect as a carrier for your cat that can provide assured protection as well for cats weighing up to 30 pounds. This product has a fiber zipper rather than a plastic zipper. Plus, a user can effortlessly zip and unzip the stroller. Furthermore, it can be folded quickly and easily. This product has big 6" wheels, which makes it easy to glide it on a rough as well as a smooth surface. This cat stroller is the Upgrade Pick. It has the highest quality with a high value. This is a heavy-duty pet stroller brand, which is super durable and safe. It can run on all terrains and can fold quickly and simply with a single hand. Ideally, it does not take up too much space as well. Its mesh top and ultra-violet reflective material helps protect your cats and is useful for the owner too, for carrying stuff in its extra storage basket. It has an extremely big compartment for storage below the stroller’s carriage for storing the stuff that you would like to carry along with you. It has two pads to provide maximum comfort to your four-legged feline. The materials used in the manufacturing of this product are washable. This will enable you to keep it sanitary and clean for your feline. This is also a great cat stroller to consider for your cat. It is ideal for babying a pet. It is lightweight and features an undercarriage space for pet essentials like treats and leashes. Made with the aluminum frame, this stroller has an open roof for anxious pets that need to keep an eye on their parent. The fabric used in the making of this stroller has a coating that is waterproof, which will keep your feline friend warm as well as dry during rainy days. Its handles can be adjusted according to the requirement. This product comes in two different colors. Additionally, it has pockets on the sides for storing stuff. Moreover, it has an extra storage for keeping water and food. If you are looking forward to buying a cat stroller, then here are some of the things that you must look for in the best cat strollers. Based on your cat’s size sturdiness and durability are most important factors to think about. Ensuring that your stroller will resist the test of time is vital; otherwise, you’ll be spending much more later on. Certify that it is made from durable materials ensure that all pieces are in excellent condition for both you and your cat’s protection and safety. The stroller size is essential to look into so that the cat loves being in it. The golden rule is to never purchase a stroller that is overly narrow as it can get uncomfortable for your cat. Mostly, air wheels are recommended in most stroller cases, but you can consider the rubber filled ones as well. A quality wheel is important if you are a fast walker so that the stroller can be handled smoothly. You will not wish for unnecessary bouncing or a bumpy ride when you’re walking along with the stroller. A good-quality wheel is imperative or both you and your cat to have a soothing outdoors moment. Handle Height: With most people having back pains, considering the stroller’s handle height can be a prudent idea. You would not like bending in excess, while you’re moving the cat stroller. Hence, look for those cat strollers that have a medium-level handle that is within your reach, without being too close to the body of the stroller. Weight Limit: This is an important factor to consider before buying a cat stroller. Do not just count the present weight of the cat in question, but also think about the upcoming future. If your cat is still growing, just add some more pounds to its weight. For families with multiple cats, you’ll have to take the cumulative weight into due account. Lightweight: If you required moving the stroller up the stairs, this can be a significant point while narrowing down your stroller choices. Otherwise, you’d have a difficult time in maneuvering and pushing a heavy object. Appearance: Most companies that are making cat strollers tend to incorporate the choice of colors. You can be as bold or funky as you like. If desired add colors to the stroller too. Privacy: You need to consider the social level of your cat. A few strollers hold sections where pets can witness the outside world; yet have a personal, tented space also for the shy kitties to take pleasure in and take the ride anonymously. Convenient: Make sure that your selected cat stroller holds the pockets that you require for a leash, and water bowl, along with other pet essential items. In addition, you need to buy a cat stroller, which looks good as well. A well-thought-out stroller design can get a little more costly, but it’s worth each cent. Easy to Fold: It is extremely vital that the preferred cat stroller that you are purchasing is trouble-free to lug around. It is highly recommended against buying cat strollers, which are not foldable as they make no good sense. In addition, make certain that the preferred cat stroller is painless to carry. Easy to Assemble: You must consider the easiness of portability and assembly. You need not have to spend hours on putting together a new cat stroller or having a stroller that you cannot store easily. There are a lot of cat strollers in the marketplace that can fold up easily, takes up much less room, are lightweight, and are unproblematic to assemble. It is vital to remember constantly that you are hauling your cats around. Clean-up of the stroller needs to be trouble-free. Otherwise, you’ll be in profound trouble soon after. At times, cats can get very messy, and for your own good, do not opt for a cat stroller type that is almost impossible to sanitize on a washing machine. This can be your greatest slip-up. One more important factor to deem about when buying the best stroller for your cat is security. No one can love your pet as much as you would. You would, of course, wish to take care that your out-of-doors adventure is not just fun, but safe as well. Though the open-faced cat strollers can seem cute, yet you can end up with an absconder. In this case, what you really need is a stroller covering, which is sturdier and thicker. At the same time, you need to make sure that your pet does not scorch in there. There are a lot many things to think about when it comes to the safety of your pet. You need to recognize that a cat stroller is nowadays a hobby driven merchandise. It can come out as a great present for a cat parent or something to have for your own pets. Consequently, reflect on the price as well. You need not pay out a lot of cash for a cat stroller as it simply does not make too much sense. It is important to consider your own budget and pay a good price so that you get a hold of the apt product quality. Do not go too low or too high. Cat strollers can allow you to carry your four-legged friend with you whenever they get too tired. It is the ideal way to take your cat outdoors and spend quality time under the sun. You need to pick out the best cat stroller that suits you and your kitty’s needs. Among all the products listed above, the VIVO Four Wheel Pet Stroller is the Editor’s pick. It is presently the best available product on the market that features all the looked-for requirements in a good and durable cat stroller. It can keep your cat comfortable inside and can bear up to 30 kg of weight. You can confidently buy it for your pet strolls. If you have any more questions, do write to us!